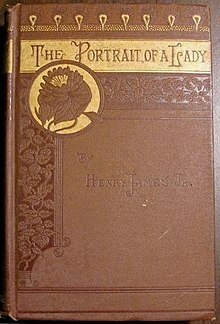 The decorated cloth cover of The Portrait of a Lady, by Henry James, published by Houghton Mifflin in 1881. A good example of Victorian decorated cloth. The binding serves both to protect the book and advertise it. A book cover is any protective covering used to bind together the pages of a book. The covering may be of paper, or hard paper boards, or even plastic. The boards may be covered with paper, cloth or leather. They may be laminated, with a plastic layer onto paper. There is a distinction between hardbacks and softbacks, which are usually sold at different prices. Hardbacks may be covered with a dust jacket designed to attract readers. Softbacks are almost always designed to attract sales in bookshop displays. The evolution of printing methods has made the production of books very much cheaper than was the case with early printed works. As a result, books are bought and read in great numbers. They compete against each other in the marketplace. The function of book design is partly to help the reader, but even more to persuade the reader to buy the book. This page was last changed on 29 November 2018, at 13:28.